Today, 4 August, marks the 143rd anniversary of the death of Hans Christian Andersen, the prolific Danish author best remembered for his fairy stories, including The Little Mermaid, The Little Match Girl and The Ugly Duckling. 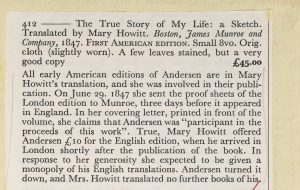 Andersen was born in 1805, the only child of poor and uneducated parents who told him the family rumour that they were descended from nobility on his paternal grandmother’s line. After receiving a basic elementary education, he found brief success with the Danish Royal Theatre, until his voice broke, and he turned to writing seriously. Patrons he met through his time at the theatre helped him pay for further schooling. His academic work was mediocre, his ambitions were mocked, and he was still experiencing grinding poverty. It would be another 2o years before he became an international storytelling sensation. His first forays into publishing fairy tales in the 1830s were widely ignored, although his novels, travel writing and poetry found success. His first fairy tales were re-tellings of stories he had been told in childhood, and it was only towards the end of the decade that he included original fairy tales in the compilations. His inspirations came from his own life; his childhood poverty, the early death of his father, and his miserable experiences at school. 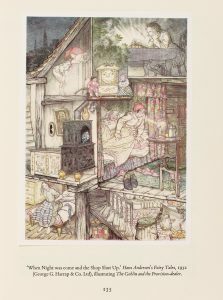 Andersen had a wonderful imagination and realised children were the primary audience for his fairy stories, but in order for his books to be popular, they must also appeal to the parents who would be listening and telling the stories to their children. 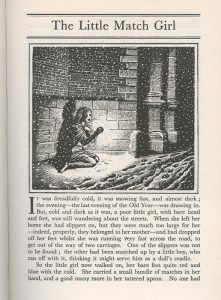 One of his most famous original tales is The Little Match Girl, published in 1845. It was inspired by Danish artist Johan Lundbye’s image of a beggar girl selling matches that was featured on a calendar. In Andersen’s short story, she is sent out to work by her violent father on a snowy New Year’s Eve. Failing to sell her matches, and afraid to go home, she huddles in a nook and lights the matches one at a time to warm herself. Dying of hypothermia and ignored by passers-by, she sees glorious visions in the flames of feasts, Christmas trees, and – as a shooting star falls (signifying a soul going to Heaven), – a vision of her deceased grandmother. Striking all the remaining matches, she makes a wish for her grandmother to take her with her. The following morning the little girl is found frozen to death, still clutching the burnt-out matches. The very strangers who refused to help her in life pity her in death. It is a characteristically grim ending but Andersen did not consider his story a sad one. She is saved from the horrors of her lonely death through the power of her imagination, and she goes with the one person who loved her to a place where there was neither cold, nor hunger, nor anxiety. The ten tales in ‘Wonderful Stories for Children’ were the first to be translated into English, by Nottingham children’s author Mary Howitt. We have a first edition signed by Howitt, which is currently in the exhibition and is discussed in this short video. 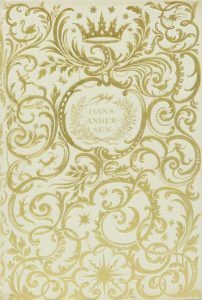 She learnt Danish specifically to bring Andersen’s works to the English-speaking world, and his fairy stories have not been out of print since her book was published in 1846. Initially friends, the two ended up having a falling out. In part, as the image below indicates, because she was annoyed that he did not give her exclusive translation rights (others very quickly followed her lead, as equally poorly translated and censored to suit the Victorian sense of morality). After a long and distinguished literary career, Hans Christian Andersen died aged 70 in Denmark, having never fully recovered from injuries sustained in a fall from bed three years earlier. His stories have been translated into numerous languages and have inspired ballets, music, films and artworks. Some of his stories, including those illustrated by Rex Whistler and modern theatrical adaptations for children, feature in the Weston Gallery exhibition ‘From Rags to Witches: the grim tale of children’s stories’ which runs until the 26th August. For more information about translating children’s books, watch a recording of Dr Gillian Lathey giving a talk ‘Invisible Storytellers: Cinderella, Pinocchio and the remarkable role of translators in the history of British children’s literature‘. To find out more about Manuscripts & Special Collections, visit our website, read our newsletter Discover, or follow us @mssUniNott.